We are here to support student success! Arts and Sciences firmly believe that we are partners with our students. Together we embark on an educational journey . We are the navigators while the students are the drivers. We educate our students on pathways to degrees. We expose our students to strategies, tools and resources that support their progress. We offer enhancement opportunities by connecting the students with their department and other resources. Be forthcoming and clarify your academic needs- Advisors advise, but you decide! We offer our students several modes of connecting and communicating with us. Click here for detailed description of delivery methods. Our advisors spend most of their time in the departments of the students they serve but the Advisement Center is our "Hub" and you can always ask us in the center where to go for your individual needs. 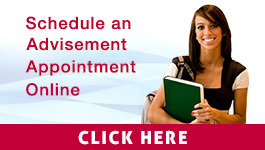 Appointments and walk-ins vary with advisor - see LoboAchieve for details.